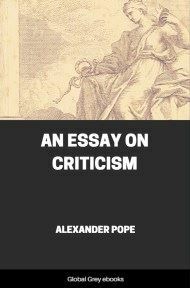 An Essay on Criticism is one of the first major poems written by the English writer Alexander Pope. It is a verse essay written in the Horatian mode and is primarily concerned with how writers and critics behave in the new literary commerce of Pope's contemporary age. The poem covers a range of good criticism and advice, and represents many of the chief literary ideals of Pope's age. Includes an introductory chapter about the author.